Rainbow Precision Products cast iron mounted bearings are made to ABEC-1 tolerance standards. All bearings have a deep-grooved ball bearing insert and are double sealed. Mounted ball bearing units are made with 2 set screws 90° apart and are completely sealed. This allows for easy lock down on the shaft and prevents the inner ring of the bearing from spinning independently on the shaft. 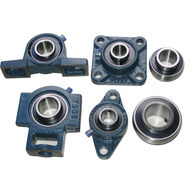 Mounted ball bearing units come with steel retainer and also have grease fitting for easy lubrication. Mounted bearing units can handle 2° of shaft misalignment. Temperature range is –4° to +220° F. Bearing locking collar and set screws are included. If you are looking for wash down duty stainless mounted bearing units, click here.